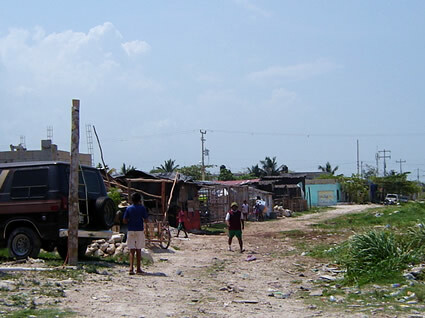 We were driving home from the beach at Isla Blanca the other day and ended up passing through a very, very poor area on the north side of Cancun. I thought I would share some of the photos I took. 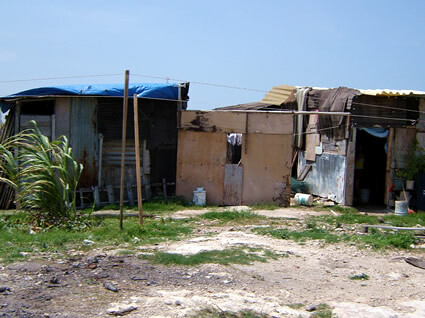 Next time someone tells you that there isn’t real poverty in Cancun you can tell them they are dead wrong. By the time we drove out of this area I was in tears. I can’t imagine raising a child in a place like this. 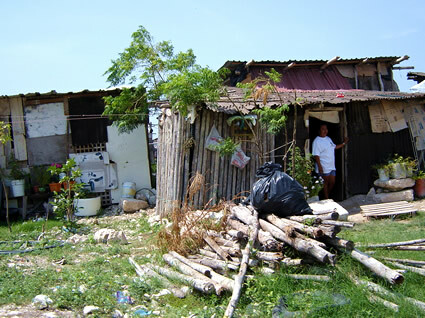 If you are interested in finding ways to help fight poverty in Cancun I recommend getting in touch with the City of Joy Foundation (FundaciÃ³n Ciudad de la AlegrÃ­a, A.C.). 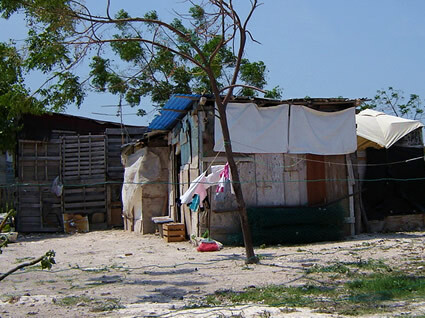 City of Joy Foundation has a number of effective programs that work to help Cancun’s poor. This entry was posted on Sunday, June 7th, 2009 at 8:50 am	and is filed under Uncategorized. You can follow any responses to this entry through the RSS 2.0 feed. You can leave a response, or trackback from your own site. Hey there. You’re back. Good post. Thanks for sharing the pics. There is so much of a slit economy here in the Rivera Maya. Is this isla mujeres county or is it still BJ? that would be good to know! Thank you for sharing this Rivergirl, too many people never see past the glitz of the hotel zone (and that includes many people who actually live here, I’ll admit I’ve never seen the areas as bad as what you’ve posted). Sobering pictures. 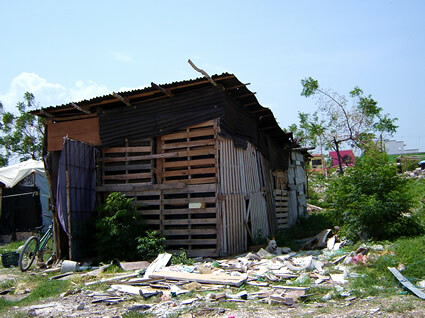 I had seen a few shacks like this in Cancun before. But when we found this area I couldn’t believe how many shacks were there. My pictures don’t do the area justice. There were acres and acres of shacks, with no plumbing and no electricity (well, maybe pirated electricity). It was incredible and jaw-dropping. Iaax Page – Hey man! Good to see you here. My pix were taken a little west of Rancho Viejo on the north side of Cancun, definitely within the city. So I would say it’s in BJ for sure. I’m sitting here appalled at this poverty and not knowing what to say. One wonders why the people have moved there. They can’t be Cancunenses. Probably moved to escape poverty and found this instead. Many tourists drive by the “invasion” here, which looks a lot like this place, and think it is just another poverty stricken area. IslaGringo – I had the same thought, that these must be recent arrivals from other parts of Mexico. Not sure of that. But this shanytown did not exist last time I drove around near there. It was just an empty field a couple of years ago. Thanks for raising this issue. Such a contrast to the hotel zone. I was researching issues in cancun and hardly anything came up. i was thrilled to find what you posted because it shows what we really need to see in order to help. i was shocked by your pictures and they have left a lasting impact on me. thank you. 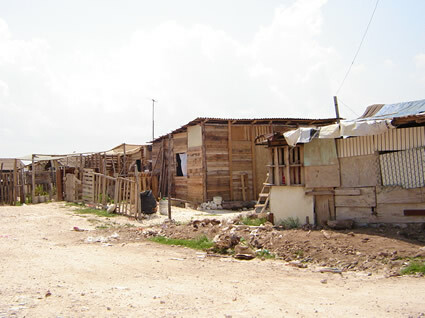 Cancun has miles and miles of shacks like the ones in my photos. Poverty here is much worse than most people realize. You know this is the paradox in which most of us live.The world knows this part of the earth as wealthy and rich and the reality gets reflected when there are poor people living in that same place. Even worse we didn’t even knew that they existed! Now think of the entire world.What poverty,damage,destruction has been inflicted on the earth by the policies,politics and war. The thing is not only with Cancun,it is with our home which we call earth. Google Street View is currently photographing Cancun. My hope is that they will actually photograph ALL the streets. That way these shacks and all the rest of the shacks will be part of the public record. Entries (RSS) and Comments (RSS). 39 queries. 0.561 seconds.